Recent soccer tournament made the world think that for South Africans vuvuzela is the only instrument they know – definitely a grave misinterpretation. As a recent example of successful South African music, take Elvis Maswanganyi AKA DJ Mujava and his “Township Funk”. Or from earlier times, minimal and micro house artist Portable, in addition to the local rap scene. I believe there’s still a lot to discover as the music from the Southern tip of Africa. “Soweto Disco” is a 12-inch full of party feeling, offering a modernized collage of South African shaking disco and funk from late 1970s to early 1980s. 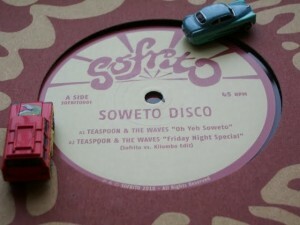 A collective called Teaspoon & The Waves delivers two tracks – starting with “Oh Yeah Soweto” that moves masses in a vein of disco’s pioneer years. The opener is also the most average track of this release. On the A-side follows funkier “Saturday Night Special (Sofrito Vs. Kilombo Edit)”, assisted by an energetic electric guitar, creating a mild and concrete atmosphere in the same. Sounds like “Papa Was A Rollin’ Stone”, more precisely the version by Was (Not Was). B-side is brilliant: Blessed with Nzimande Allstars and “Highway Sporo Disco” that is along and rolling jazz funk fitting well to the mirror-ball-decorated rooms. A tricky electric organ launches the party, guitar squeaks in almost oriental mood and horns screech like elephants. Makes wait for Sofrito’s next releases.